Following their visit to the Amazon rainforests last week, James Cameron and Sigourney Weaver headed back to Washington DC to talk about their experience. The pair were in Brazil to raise awareness of the indigenous communities’ battles to stop the massive Belo Monte Dam on the Xingu River in the Amazon rainforest. On returning to the US, they learnt a judge had ordered the suspension of the preliminary license for the Belo Monte hydroelectric dam and the cancellation of the auction. “It’s great that the judge did it, but it only gave us more time to keep organizing,” said Weaver. Weaver joined Cameron again on Saturday in New York to host the Eco Warrior Training competition at Brooklyn Technical High School. The competition featured a host of local high school students delivering speeches on “An Environmental Lesson I Learned From Avatar and How to Apply it in My Community, New York City, America and/or the World.” Prize scholarships up for grabs totaled $12,000. “As a New Yorker, I’m thrilled to be here to meet you, to talk to you about all of us becoming eco-warriors because our planet needs it,” said Weaver. ""I think children have a connection to nature that’s so deep when they’re born, and they’re closer in a way than we are as adults." The Eco Warrior training continues in LA on Thursday – the 40th anniversary of Earth Day – with the Home Tree Earth Day event. 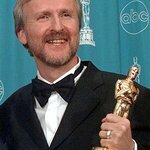 James Cameron will take 5000 students from Mayor Villaraigosa’s Partnership Schools to the Nokia Theatre for a special screening of Avatar, followed by a discussion on the film’s environmental themes. He will also present The Avatar Award to the winners of the Eco Warrior training speech competition. Following the screening, basketball star John Salley and actor James Cromwell will talk to the students about the importance of protecting the planet and the many benefits of a healthy vegetarian diet. Michelle Rodriguez will be DJ’ing during the breaks, Giovanni Ribisi and Joel David Moore will also attend and speak as will Mayor Antonio Villaraigosa, Suzy Amis Cameron, Rosario Dawson, Billy Zane, Daryl Hannah and more. Find out more at the event’s special Facebook page.